Your dog has been diagnosed with arthritis or some other condition that affects his mobility. What now? We have come a long way in the world of assisting our pets when they have issues getting around, particularly in a time of hardwood floors and tile being the norm for today’s houses. Clients are always looking for help in making things easier for their four-legged family members. One of the most effective methods for helping impaired dogs get around is to increase the traction between them and slippery surfaces. There are many available items on the market today and it really comes down to what your dog will tolerate and what works for them (and you) individually. Traction booties, toe grips, carpeting, area rugs, runners, or yoga-type mats placed on slippery floors are some options. Stairs can be a very big obstruction for pets who are unable to maneuver safely, so placing traction strips, carpeting and overlying ramps can help dogs still utilize steps safely and without hesitation. For dogs recuperating from intervertebral disk surgeries, hip replacement, or cruciate ligament tears, utilizing slings and harnesses can help you control their activity while limiting their weight bearing and potential for injury. 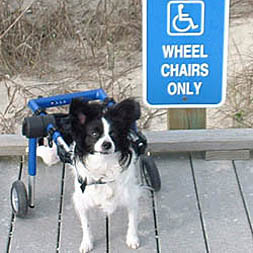 There are even carts and wheelchairs if your dog has gotten to a point where they are unable to maneuver around on their own. Again, the most important aspect of achieving success is knowing what your dog will accept.Please contact your veterinarian for advice on managing your pet’s mobility issues.